ignored by market analysts and investment bankers. The prolonged period of low interest rates has slowly poisoned balance sheets, which will eventually lead to more consolidation—even for reluctant banks. Proper analytics are necessary to understand the new M&A landscape, what it will mean for individual banks, and how banks can gain a competitive edge through acquisitions. As this inevitable consolidation looms, banks are beginning to jockey for position as either potential buyers or sellers. One essential new metric is the Invictus Return on Required Capital Ratio, which calculates the gross asset return divided by the regulatory capital required to support the assets for each bank. Think of it is a measurement of earnings quality – the higher the ratio, the more return a bank is generating on its assets relative to the risk. This ratio is crucial because two banks with identical total assets could have substantially different regulatory requirements based on their loan mix. Each quarter, Invictus Consulting Group uses its cutting-edge analytics, which include a public data stress test on every bank in the country, to determine its best M&A strategic option. This is called the Invictus Acquisition Gauge, and it classifies each bank with less than $50 billion in assets as a buyer or seller in varying categories: Must Buy, Should Buy, Must Sell, Should Sell and Balanced. Now that we are eight years past the financial crisis, we can see the impact of the unprecedented monetary policy that has forced banks to accumulate assets under artificially low interest rates for years. Across the U.S., 966 banks either Must or Should Sell. These banks are undercapitalized and have weak earnings, both in terms of quality and quantity. They are caught in a ‘chicken and egg’ game where they need to grow to increase their earnings, but simply cannot grow due to lack of capital. The writing is on the wall for most of these banks. Barring a miracle, many of them will begin to succumb to shareholder fatigue as their dividend drought continues with no end in sight. The good news for these banks is that their loan portfolios may be attractive—they tend to consist of older vintage loans, which have better rates, and have been right-sized from a risk perspective through their historical provisioning and charge-offs. The trap for any of these banks is that they are BURNING capital that could be used for acquisitions by making higher risk/lower reward loans. These loans are tantalizing: they increase the QUANTITY of earnings in the near-term. Making a multifamily loan at 3.5 percent will be better for next quarter’s earnings then owning a 10-Year Treasury note at 1.8 percent. However, these loans are requiring more and more capital to support them as the U.S. monetary policy fuels inflation in asset values. Capital requirements for new loans are exacerbated by slipping underwriting standards as banks compete to win new business. As a result, these newer loans to riskier borrowers generate a very low return on capital. As banks accumulate them, they are limiting their strategic options. These loans eat into the bank’s capital war chest, which could otherwise be more usefully deployed into acquisitions. 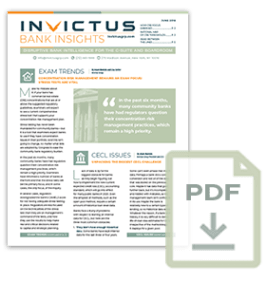 Due the declining interest rate environment since the Great Recession, Invictus calculates that banks need to increase their loan books by 5 percent annually just to keep interest income steady. Alternatively, taking into account expected loan run-off, banks need to underwrite about 40 percent of their current loan book value over the next two years to keep the same interest income level that they have now. Alternatively, there are 2,857 banks that are Balanced by our measures. These banks have true earnings of the highest quality (as measured by their return on required capital). These Balanced banks are the “Earners” – while the Should Buy and the Must Buy banks are trending toward “Burners”. The irony about many of the Balanced banks is that they have resisted the temptation to maximize the quantity of their earnings by using their excess capital to originate higher risk/lower yielding loans. Their instincts allowed them to keep excess capital idle, earning no return in the short-term, but positioning them perfectly for the long-term. They are feeling the pinch now, often frustrating management, directors, and shareholders due to the lack of growth and reckless competitors who are poaching their customers with low rate loans. The more aggressive banks in this group will have their instincts rewarded because they will have larger war chests for pursuing acquisitions. If the 970 Must Buy banks do not take action, they are in danger of becoming reluctant sellers. While they have plenty of capital, their Invictus Return on Required Capital Ratio (quality of earnings) is so anemic that organic growth is not a practical option. Some of these banks are publicly traded, and will eventually become swarmed by aggressive activist investors, who will pressure the bank to drain their biggest strength – their capital — through dividends and stock repurchases before leaving the bank with no choice but to ultimately sell. In other words, if it weren’t for their excess capital levels, these banks would be MUST or SHOULD SELLS, which would double that number. The longer they choose not to deploy this excess capital, the sooner their shareholders will ultimately become fatigued. Acquire or be acquired – there is no other relevant choice for this group. There are more than five buyers for every seller so if you snooze, you lose. Thanks to the regulators, the industry as a whole is overcapitalized and we now have a situation where there are many more banks with the means to become acquirers. As a result, would-be acquirers will need to find ways to differentiate themselves and gain a competitive advantage in the M&A market. Otherwise, they will be left behind and find that their local competitors have either become stronger or have been acquired by a larger institution that is ready to take their customers by offering more services and better rates. Again, choosing to ‘go it alone’ is an option that must be chosen carefully because your competitors may otherwise choose for you. The results of the Invictus Acquisition Gauge shed light on where M&A activity might – or won’t – easily occur throughout the U.S. The states with the highest ratio of buyers to sellers are nearly all in the West (with the exception of Kentucky), while the states with the lowest ratio of buyers to sellers are all in the East. Whether intense buyer competition drives more merger activity is yet to be determined. It is also worth noting that, although the West appears to have fewer sellers relative to buyers, it also contains the vast majority of agricultural and energy banks. Both sectors are beginning to experience stress. Although the banks appear to be in a strong position to withstand stress from a capital adequacy perspective, more bankers are beginning to talk about selling as a means to maximize shareholder value, rather than experience the hardships of another downturn. There are also looming succession planning troubles as well within agricultural banks, which will provide a further catalyst to future M&A activity. Invictus has created a version of the Acquisition Gauge every year since 2013. The methodology has changed as economic and regulatory conditions have changed, which makes direct year-to-year comparisons invalid. The one thing that has remained constant is the value of analyzing loan vintage, composition and distribution under stressed scenarios to calculate regulatory capital levels. The following charts examine the average Invictus Return on Required Capital Ratio by asset size. As we said earlier, this ratio is a key new metric that must be used in M&A analytics to achieve meaningful analyses. Invictus’ analysis suggests small banks are getting better risk-adjusted returns than larger. This may be because they are less likely to be publicly traded, are in rural markets where competition is less intense, or have tighter, more involved management. Larger banks may be more aggressively pricing their loans, possibly due to more competition, and have other income streams. Whatever the reason, this result flies in the face of what many bank analysts say – namely that community banks “need size to thrive”. Our analysis suggests smaller banks are more efficient capital allocators than larger. But that also means they make great acquisition targets. This graph shows how the balanced banks have a better ROE than all other banks. Community bank executives have often believed the way to increase their loan book is to hire loan officers. In the current environment of squeezed margins, stretched valuations, increased regulatory pressure and intense competition, that’s potentially a very dangerous path to take – and one that the stronger banks in the country have not taken. It’s much more sensible is to look at clearly targeted acquisitions, selecting a bank that has loans of the appropriate vintage, not just loan type and geography. It’s also essential to use the proper analytics when contemplating an M&A transaction. Invictus uses this analysis to identify potential targets for its bank clients and conduct early-stage due-diligence on a short-list of the most attractive-looking candidates. Initially this analysis can be done using public data and Invictus’ renowned stress-testing process. This process gives clients great insights into the state of their own bank and potential acquisitions, meaning in some cases they understand the acquisition bank better than that bank’s own directors. This is a powerful position to be in for any acquisitive bank. For more information, please contact the author at amustafa@invictusgrp.com.